For the first time in five years of ownership Box failed to start for me. No bad for an 8 year old car with 182K on it. It had started fine when I left work, but after stopping home just long enough to pick up my girlfriend there was no sign of life from the starter. No click, no power draw, nada. I ended up driving the Truck for a week while my new starter was shipped to me. Once it arrived I swapped it out. It was pretty easy and nicely accessible, unlike the one on my old Taurus where you had microns of space to work in. Once the starter was pulled the failure point was readily apparent. 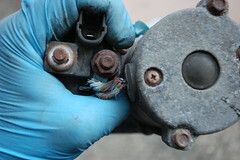 The cable bringing power from the solenoid to the starter motor had burned through. While I could probably have had this repaired at a starter shop, it just wasn’t worth the time & money. 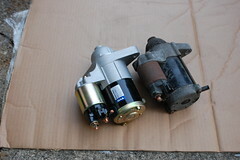 The starter I’d sprung for was a completely new one made by TYC and sold by Rockauto.com. With shipping it cost me about $10 less than a rebuilt one from the local chain auto parts store. I figured since I am planning to keep Box for as long as possible it was worth putting in the best parts I could get. The install went easily, and Box is now up and running fine again. 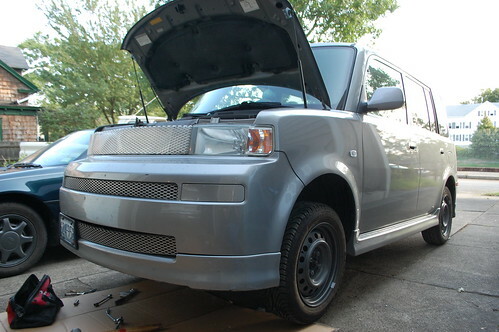 This entry was posted in 2004 Scion xB "Box" by Pixel. Bookmark the permalink.